A couple of weeks ago I threw myself a birthday party. 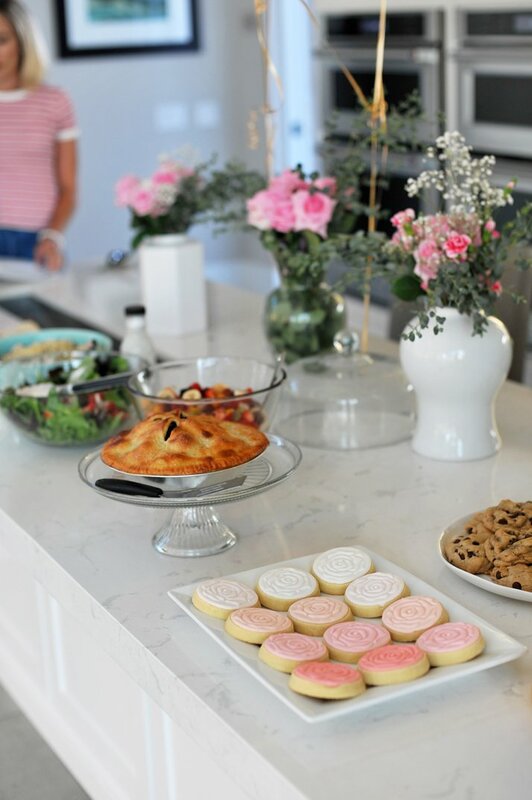 In the last few years, my girlfriends and I have thrown a few girls-only dinner parties, and it’s so fun to have a chance to get together without kids and have a mom’s-night-out. You can see our All-White Party here, and two of our Halloween parties here and here. When we moved into our new house at the end of last year, the neighborhood had a beautiful clubhouse next to the community pool, and instantly I knew I had to use it to throw a party. 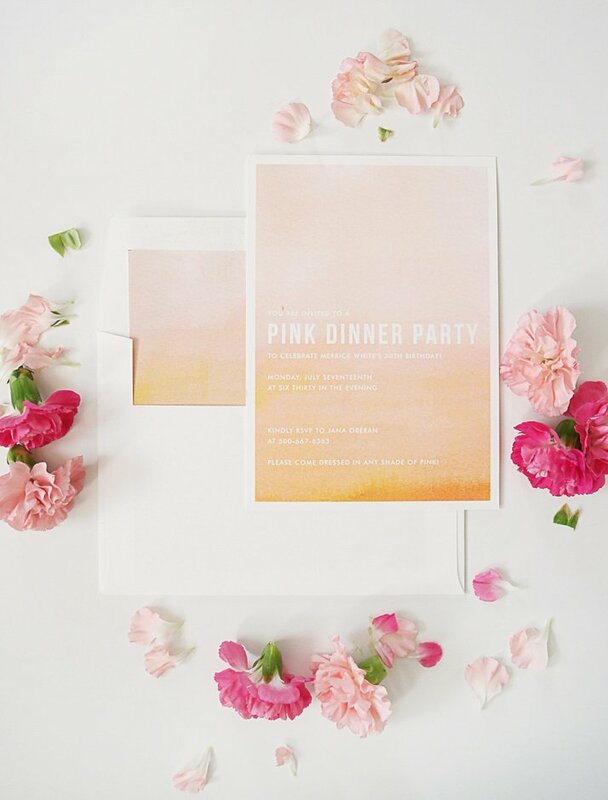 We enlisted the help of Minted to create these gorgeous ombre invitations, and the pink and orange color palette became the theme for the party. To keep my parties low key and low stress, I choose a two or three things and just focus on those. 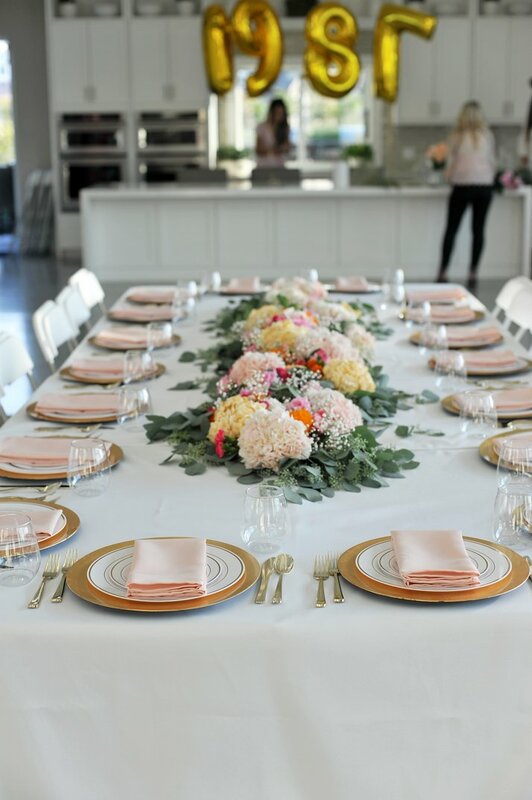 For this party, we focused on the dinner table and a photo backdrop. We also chose to have a dress code to help people decide what to wear, and also make the party feel cohesive. For this one, we set a pink dress code — come in any shade of pink. I made my wrap dress (tutorial here) but this one is really similar! I used four of these 6-foot folding tables (three borrowed from friends), and bought everything else from Amazon. Everything was disposable (except tablecloths and napkins) so cleanup would be a breeze, and this was the best idea ever. 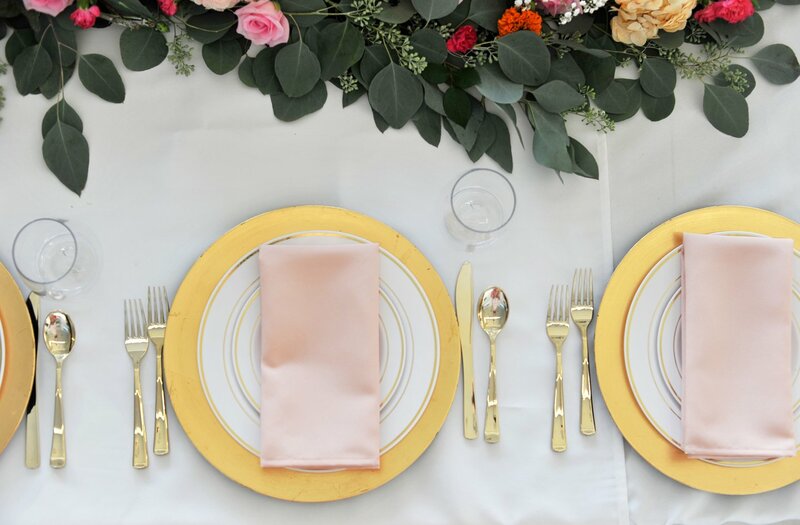 I got these white tablecloths (which were huge and pretty darn nice for the price – 2 of them covered 4 tables), these blush cloth napkins, these gold rimmed plastic plates, these gold utensils, and these plastic cups. All of them were plastic, but good quality and looked really real. I also bought these chargers, which made the table feel much more finished. Also, I rented my chairs from a local place. I got the basic white folding chairs and they were $1.10 per chair for a 3 day rental, so it was really inexpensive to get a bunch. 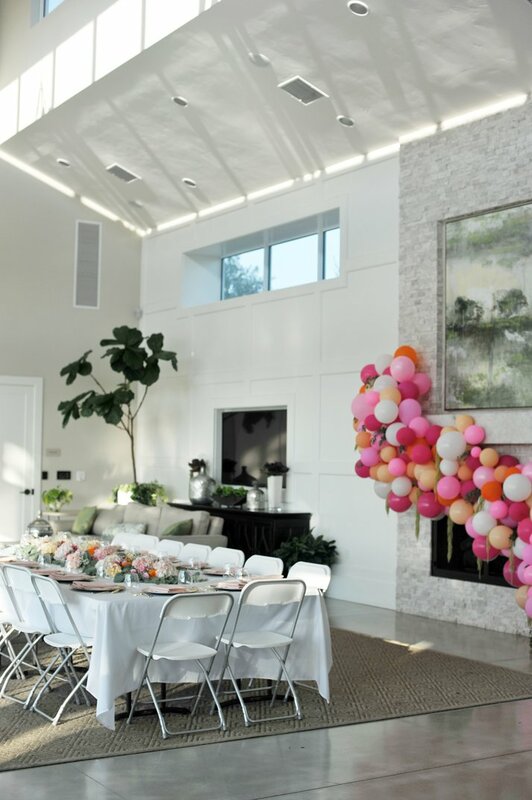 I didn’t intend to have a balloon arch, but Jana had found some really fun floral centerpieces that included balloons, so we toyed around with the idea of including those on the table. 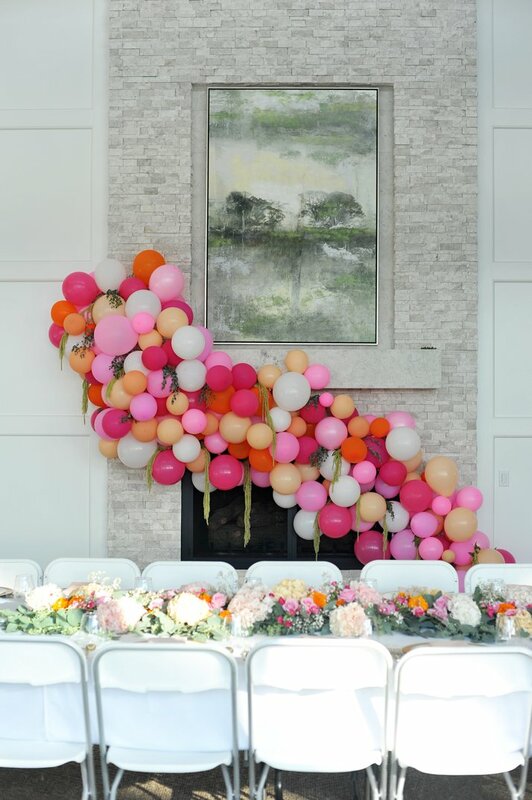 But we opted for just florals, and then thought a balloon arch would be really pretty by itself. Kayla offered her high school student government balloon arch making skills, and spent the entire afternoon building this incredible arch. She attached 3M hooks to the wall and fireplace, and then hung a large swag of chicken wire to make the shape. Then she used a low-heat glue gun and fishing wire to attach the balloons (the balloons won’t pop if you use low heat glue!). We used these air pumps to make blowing up the balloons quick and easy, so they were all blown up before she even started building the arch and cut down on her time significantly. But it still took about 5 hours! 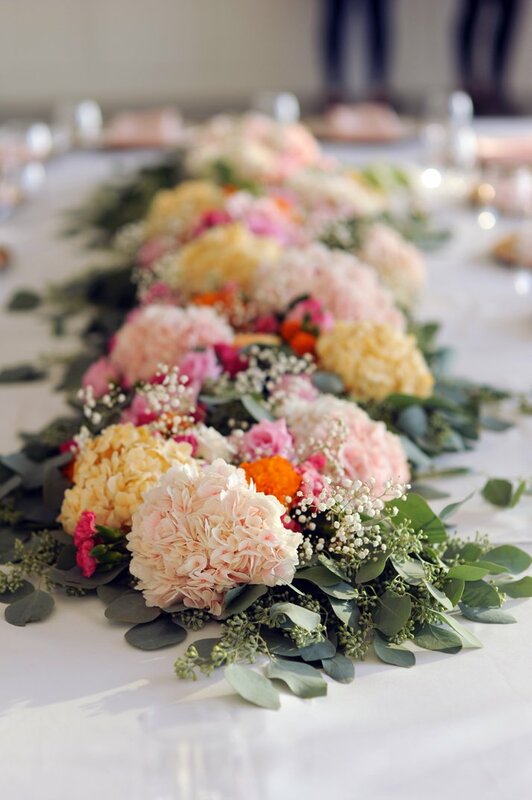 At the end, she added the greenery and it was the perfect finishing touch, and was an amazing backdrop for pictures that night! For the balloons, I bought this pink and white pack, and then these extra packs of peach, orange, and pink. I also wish I’d bought some extra white balloons because we ran out of that toward the end of the arch. I’ve seen people using these mylar number balloons for birthdays forever, but instead of a 3-0, I decided to do a 1-9-8-7 for a fun change. You can buy them in most grocery stores or at Party City, but I found them cheaper on Amazon and then took them to my local grocery store floral section and they inflated them with helium for $2 each. We attached them to the counter behind the food, and surrounded them with vases of extra flowers. 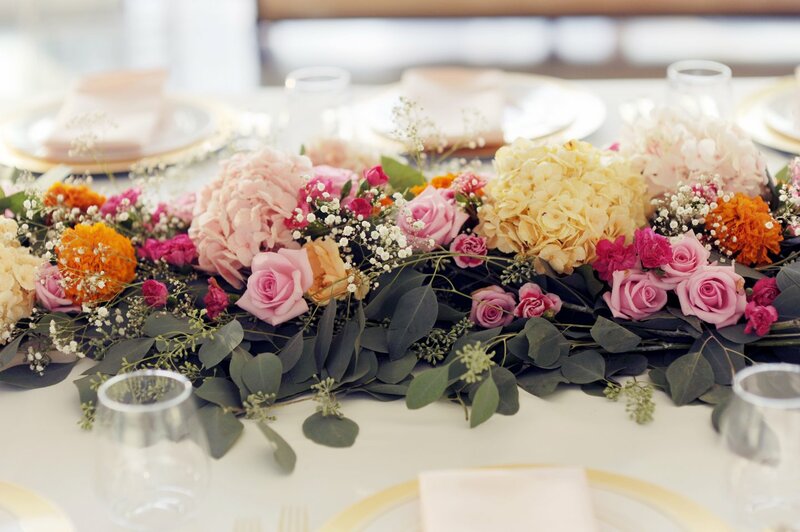 In the past, we’ve done potluck style dinners for our parties, and it’s worked great because people can make fun, fancy dishes, they feel glad to contribute to the party in some way, and it makes the workload and cost of the party go way down. But I felt silly inviting people to my own party and asking them to bring food. So Jana sent out the invitations and food assignments. Easy solution! The party was an absolute blast, and both of my friends who helped me commented on how low stress it was. When I’m stressed, I really struggle to enjoy the event, so I’ve learned to make all my parties as low key as possible so I can have fun too. 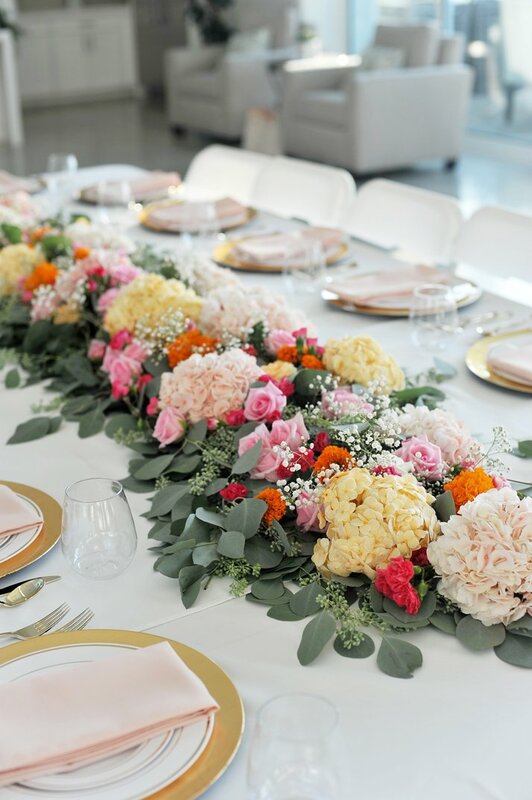 It was the perfect way to gather and celebrate with my friends. If you have any other questions on something that I missed, leave a comment! 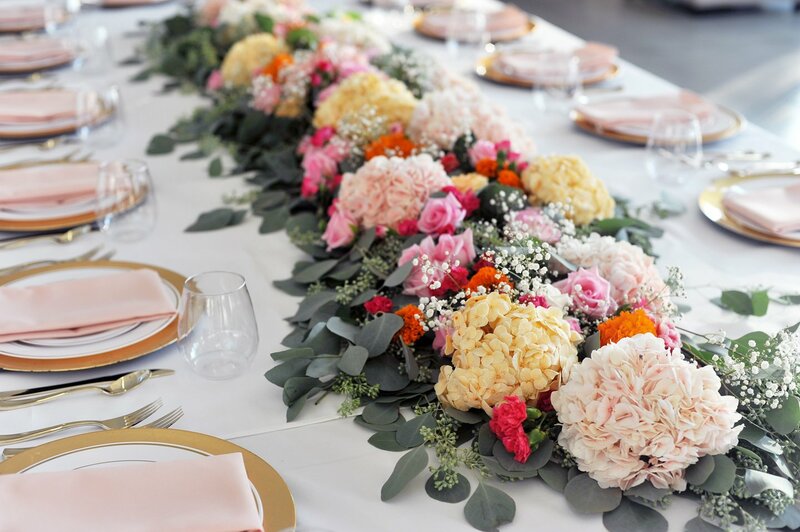 This is stunning – like my dream birthday party! Looks like a great party and the club house is a wonderful area to be able to utilise! Nice setup, very pretty. 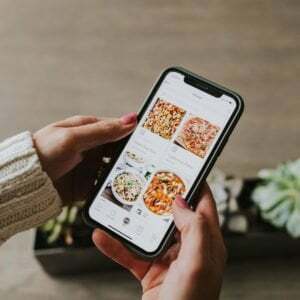 Tacky to ask people to bring food to your own party, even if your friend sent out the invite. Should have catered. Janice, i’m sure that merrick loved the people she invited, and that they loved her. If the potluck maDe the party affordable for the young family, i’m sure people were glad to bring food and love. IF it were rich strangers, i’m sure I would agree with you!